Spectacular fully-furnished brand-new (8 months old) home built of thatch and stone. Spacious lounge plus a TV room with gas fireplaces. Open-plan kitchen with sitting area, scullery and wash room. 4 x en-suite spacious bedrooms, main bedroom is air-conditioned with large dressing room and ample cupboard space, 4th bedroom being used as a study currently. Servants quarters with toilet & basin. Swimming pool and lovely outside entertainment area with sitting area, kitchenette, bar & guest toilet. 3 x carports plus 3 x garages. Price includes all furnishings. 658 Ha Game and Cattle farm. 2 Km river frontage with 20 ha lucern under irrigation. Divided camps with cribs. Cattle handling facilities. Lovely spacious home fenced off with electric fencing. Several fruit trees, beautiful established garden. Stall with trade and liquor licence. Staff quarters, store rooms, workshop and cold room. Strong water supply. Plain game. Thembi is the name of a farm (Koppieskraal 484) which is owned by a company. Thembi is furnished as a getaway for a person and his / her family that wants to do as little as possible, but still have the enjoyment of a game farm to experience. Therefore Thembi is managed by a full-time manager and his wife, 3 labourers and 3 domestic servants who stay on the farm. The manager and his team are responsible for the management of the farm, as well as small repairs to the homes, and to ensure that the wildlife, roads, fences, and nature be properly controlled. Each home prior to owners’ arrival, as well as weekly is serviced by the manager's wife and her servants and wood is delivered the day before. 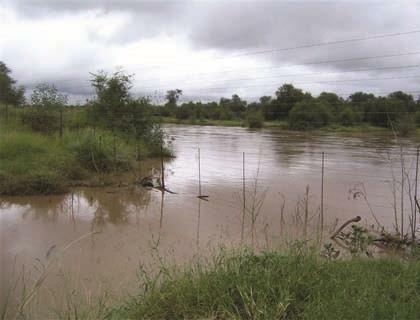 Thembi is about 75 km west of Bela Bela, and 17 km north of Rooiberg, near the Modimolle (Nylstroom) - Thabazimbi & Bela Bela (Warmbaths) - Matlaba intersections. Approx. 2 hours from Pretoria and 2.5 hours from Johannesburg. The company only has 10 shareholders, each owning 10%. There may be no more than 10 shareholders, unless a majority of the current shareholders decide otherwise. Audited financial statements are available on request. 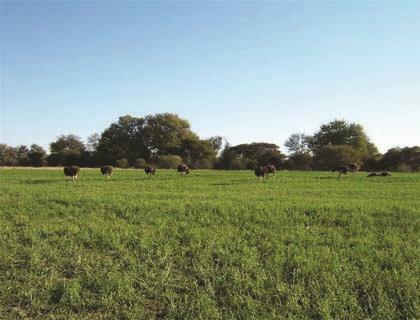 The advantage of a company owning the farm is that the transfer of shares takes place at 0.25% instead of the usual 5% - 10% (depending on the legal identity of the buyer) duty on immovable property, a significant savings for a prospective buyer. Each shareholder has his own home, solely for its own use. There are 10 homes on Thembi. Thembi is about 1200 hectares. Each shareholder therefore indirectly owns 120 hectares. But each shareholder has full access to the entire 1200 hectares. The place feels much larger than 1200 hectares, because it is hilly with varying landscapes. There are no land claims against the farm. Just outside Thembi's gate is a 24 hour manned security point, which is in radio contact with a control room. This security point takes the details of all vehicles / pedestrians travelling on the road passing Tembi. Of course they also monitor Thembi's gate. There has never been any unpleasant incidents on Thembi. 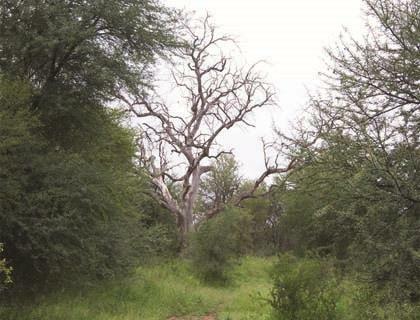 Thembi is fully fenced with a game fence, and there are many species of antelope and giraffe. The most recent game count is available on request. Only bow hunting is allowed. As a result the game is very tame. There is also a fully equipped hunting lodge (with showers, hot water, cooking facilities, bar) that can accommodate 14 bow hunters at a time. Each owner gets a free hunting opportunity of a week per year. Other times can be negotiated. Owners must pay at discounted price for game hunted. Pricing available on request. Cool and slaughtering facilities for hunters. Borehole water and Eskom electricity is supplied for the entire farm. Several picnic areas, ponds, bow hunting hides and about 50 km of gravel roads. The manager and employees' homes, as well as the wildlife, farm vehicles, implements and facilities are common property owned by the company owned. Double storey house with Harveytile roof & grass bedding, which still feels like a thatch roof from inside. The advantage of the Harveytile roof is that it is never needs to be replaced or maintained like a thatch roof. The house is built on a hill with a view of a large pond where animals come to drink water. 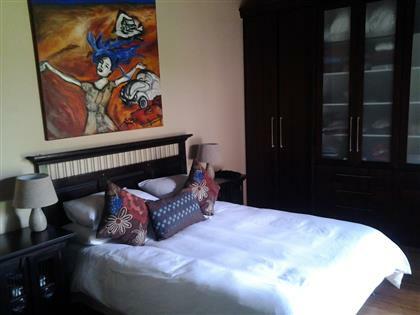 Four bedrooms – large bedroom on 1st floor can sleep four guests, so home can comfortably accommodate up to nine people. 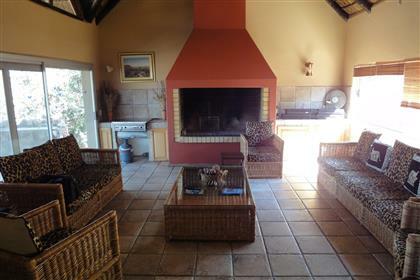 2.5 bathrooms (1 en-suite) Lounge (with built-in barbecue and gasbraai). Dining room / Kitchen. Double lock up garage. 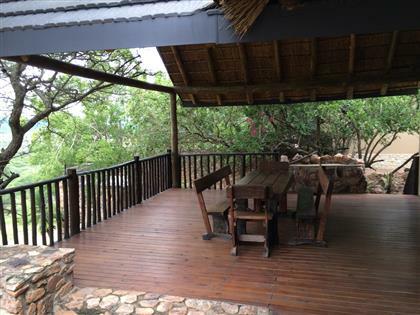 Large outdoor wooden deck with awning and braai lapa. Included is also a game drive landrover that can carry 12 people. The farm's communal swimming pool is 50 meters from the house. By the pool is a lapa and braai facilities. Many of the homes have their own pools, so the use of the communal pool by other owners are extremely rare. The monthly levy is R5,000 per owner. This includes all taxes, electricity, water, cleaning, wood, farm maintenance, salaries, etc. in. A shareholders' agreement determines the rules shareholders should abide by. The house is offered fully furnished, including bedding, crockery, refrigerator, dishwasher and washing machine. The new owner will have nothing to buy - and can immediately arrive and enjoy. The company's net asset value (equity) is more than R50 million, which implies R5 million for every 10% share. This is only a value that would be realized if the farm was sold as a whole. But this value gives a new owner assurance that his purchase priced is backed by a tangible value.